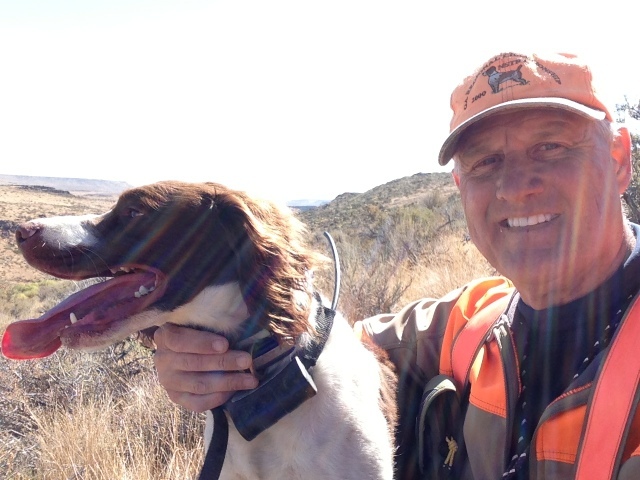 A Bird Hunter's Thoughts: Last day. Best day. We started north in the mountains. Temp was 45 and wind was west at 10-15 kts. 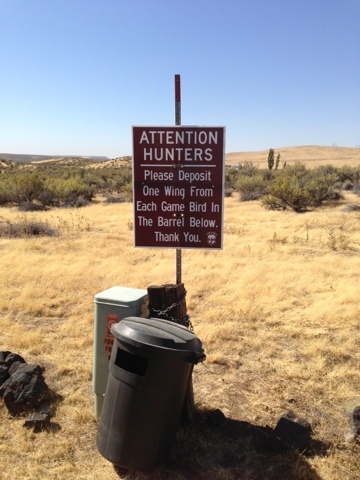 When we got on top, driving over lava rock, I was on the lookout for Chukar. I saw one feeding and put Ace out to find the covey. The single flushed and flew to Europe. Ace locked down two times but we came up dry, so we headed to the truck. 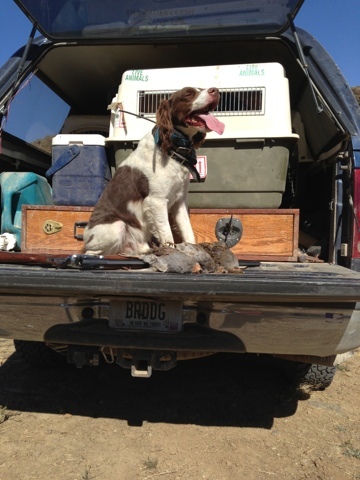 They say the first time you hunt Chukar is for sport; the second time is for revenge. True. We moved further into the mountains and stopped by a stream. Ruby was up, so we headed out across the stream and up the hill. Working to the top and on the way back down, Ruby locked up in some shrubs. I kicked around and 30 yds downhill 15 Huns got up. 14 reached the top as Ruby made a fine retrieve. About 40 yds from the truck she pointed again and all but one bird made it out of there. 2 in the bag. I put Cap on the ground and climbed the other side. 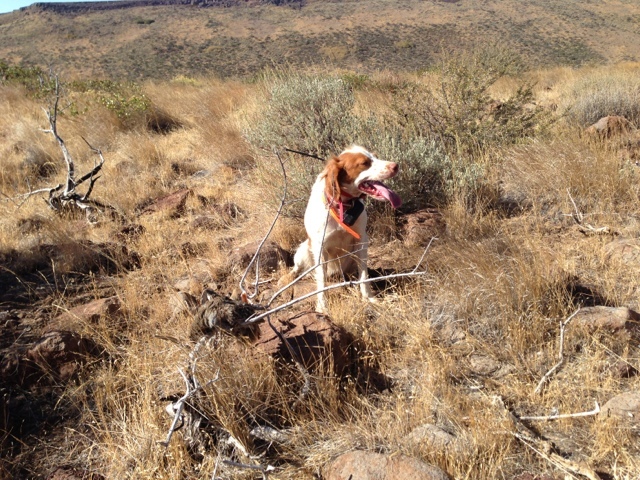 On the way back down, Cap located a single , made a good retrieve and we had 3 in the bag. I drove back to a spot on the Snake and put Bandit and Ace on the ground. They took off like at a field trial, the old man and the boy. 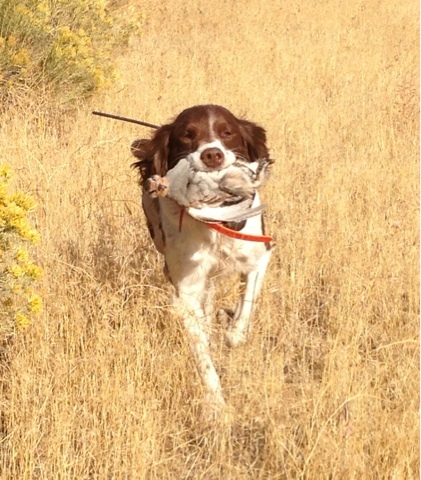 5 min later, Ace had a large covey of Huns pointed and made a great retrieve to hand. For a last day it was wonderful. It must be time to go home. I'm broke, worn out, one dog is limping, one has the runs, one is in heat but all are still ready to go. It's been a great trip to Idaho!